Davide Dazzi Bolognesi is born in Correggio (Reggio Emilia) in 1978 in a loosely catholic environment. At the age of 1.6 he gets involved with the Reggio Children lobby. Later, moved by an idealistic hope for a better world, he starts a liturgical organ course, as if it made any impact. He also plays soccer. But he suddenly quits both. He surprises everybody devoting himself to writing — rewriting, actually — placing and removing commas to exhaustion. In 2005 Davide moves to New York, where he makes a living by writing subtitles for B-movies. After some brilliant accomplishments, he gets fired for ruining a word pun. Meanwhile, Davide obtains a PhD in Italian Literature from Columbia University with a dissertation on Ubertino da Casale and some other obscure 13th-century friars obsessed with the Book of Revelation — with the generous interest of the Whiting Foundation Fellowship. He cannot keep up with all the spontaneous job offers that follow. 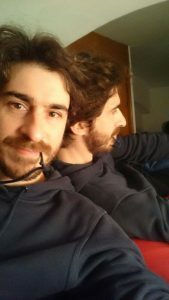 According to Colorado College, where he had the pleasure of teaching the Italian tongue, Davide is “a sincere advocate for intercultural and experiential learning”. His favorite author is Sir Laurence Sterne, followed by Czar Vladimir Nabokov. He is sincerely amused by funny dogs. As for his private life he has no secrets.